I can not remember the last time that May graduation at SDSU was 40 degrees. I always remember it being very nice out, sunny and most parties taking place on the graduates front yard drinking beer and playing bean bags. But that is not the case for this year. They are expecting a high near 42 degrees with rain and wind. This weather can not get any more depressing!! PS....my brother will be one of the many graduates on Saturday, yeah Greg! It is safe to say that we only have 9 days left, 8 after today. Medary always closes down for the summer and I go and help at the student Union with summer camps and conferences. 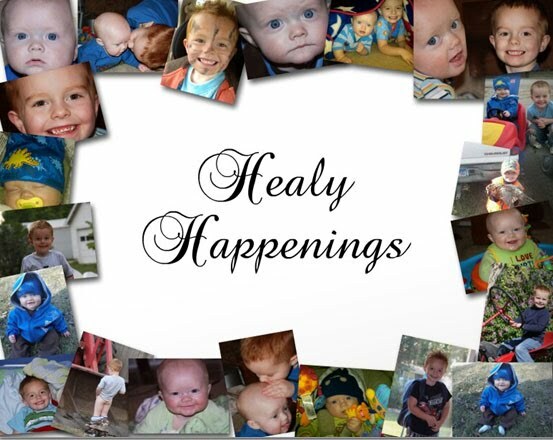 I can hardly believe that the year is coming to an end. If you were to look outside you would never think May 1 is 2 days away instead you would think March. Time sure does fly by. I am not even sure where to begin I have had such a wild and crazy 4 days. Thursday I was in Sioux Falls testing my luck finding bargains at rummage sales. The weather was the worst I can ever remember it being but Marty and I just stayed under an umbrella and kept going (12 hours to be exact). I found lots of clothes for Trevor and a top of the line Thomas the Train track (according to Trevor it is awesome) the track sits on a table and you can arrange the track however you want it and under the table is all storage, it is a great step-up and Trevor loves it so that is all that counts. Then Friday I headed to Fargo for Dawn Leibfried's wedding and we are soooo lucky we left when we did. The roads so horrible and once we got there we found out that the interstate closed, so we were very lucky. The wedding was at 4pm and the reception and dance followed, it was a great time!! It was fun to see some of my classmates again and of course catch up. Then once the interstate opened on Saturday we headed home and I picked up Trevor and we hung out the rest of the night. Throughout this whole ordeal Jon went to Big Stone Lake to go fishing in a tournament with Corey. They got just as much snow there as anyone so the tournament was suspost to be Saturday but was postponed until Sunday. They still did get catch anything but I am sure had a lot of fun. What a crazy 4 days and who would of thought that weather would of done what it did?? Does everyone know what today is?????? Yep that is right Kingswood Rummage Sale Day........waahhoooo! I am out the door in 15 minutes to see how many bargains I can find!! Well this past weekend we made a trip to the Cities to visit Jennifer and Chris. We had a great time!!! Friday night we arrived and they had supper waiting for us on the table, Chris made he famous ribs along with steamed cauliflower. It was fun to catch up over dinner since it had been before Christmas that we were there last. Trevor especially loved it since it was his first trip to there house. Saturday we spent the whole day at the Mall of America going on rides, shopping, eating and going to Underwater Adventures. Jon's cousin Chad and his family where able to join us at Underwater Adventures with their 2 kids. Here Trevor is riding one of his favorite rides, the BIG TRUCKS!! Not to mention he got to honk the horn the whole time. Then Trevor and Daddy went on the Blue's Clues ride but it was not as fun as the BIG TRUCKS. Here is a picture of Jennifer, Trevor and Jon in a shark cage. After Underwater Adventures we got Sophia to go on the Truck ride with Trevor. Before we left it was time for one more silly picture!! When we moved into our neighborhood it was during the winter months so we never saw our neighbors because it was too cold out. Well since it has gotten nice out we have noticed a lot of kids that live in our neighborhood and most of them are 2-8 which is the perfect age for Trevor to have someone play with. Well last night I was not planning on being outside a whole lot just enough to get the car clean BUT once we got home the 2 kids across the street came over and asked if Trevor could play. He was in heaven so they all got their bikes and rode down our hill in our backyard. But then more neighbor kids came over and then more after that. At one time I stood there and counted and there were 11 of them. How fun is that?? Yesterday was one of the nicest days that we have had in a long time, my car reported 76. From the minute we got home until the minute it got dark out we were all outside. Trevor just loved playing trucks, riding his bikes and of course getting into trouble. He has found the coolest new bike ramp to ride down. Jon was using it to haul stuff but Trevor had a better idea. Yep he is going down backwards. And of course he still loves going down the big hill in the backyard. 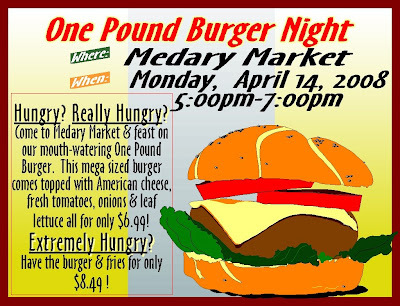 Last night I featured a One Pound Burger night at Medary Commons and it was a hit. We made 200 burgers and only had 36 left, so overall a great turnout!! Some of you might be thinking how in the world would you cook a burger that size and get it done on the inside and not too done on the outside well let me tell you. First we pattied 200 burgers that weighted 1 pound each, then we cooked them on the char-broiler (fancy name for a grill) but we only cooked them on one side. Then we placed 8 patties on a tray and cooked them the rest of the time in the oven. By doing it this way the burgers stayed nice and juicy. We tried cooking them just on the char-broiler but they seemed too dry to me and in the oven they took too long and where a bit greasy. So we came up with a happy medium and things turned out great! Well this weekend has come and gone already and not much to report except for a funny story about my brother (sorry Greg I have to share). Alright those of you who know my brother know that he is deathly scared of snakes!! I am serious, if he even comes close to one will run faster then lightening. When he was building his house they had poured the basement and where framing walls upstairs but Greg was working downstairs and I got a call from him freaking out because there were a few snakes in his basement. He wanted Jon to come over and get them out but he was not home so the guys building his house went down and get them out, so we teased him about that for a long time. So on Saturday night he went to bed around 9pm and Kelsi was sitting on the couch watching a movie and around 10:30pm she heard Greg screaming and hitting something. She went in to check on him and he was losing it hitting his hand as hard as he could on the bed post thinking there was a snake on it and he was killing it. Then he ran in the bathroom and got up on the sink and was yelling so Kelsi was scard to death wondering what in the world was going on. She thought there was a snake and she wanted to call Jon to come and get it. Turns out Greg was sleep walking we think.....he claims it was real but we have all seen him sleep walk before. So Sunday morning his hand was black and blue and his fingernail was bleeding. When Jon was telling me this story yesterday he was laughing so hard he was crying. Oh Greg we love you! Well today at work I am out 12 full time employees because of the horrible weather. If you want to see super woman perform please stop by at anytime today you will get a show worth watching. I am not sure what is wrong with me lately I just do not have a lot to talk about. Last night we really dug into our yard and thatched everything with the mower, you would not believe all the dead stuff it picked up, then we fertilized it before this storm we are suspost to get today so maybe it will get thicker and greener after all this precipitation. I am not sure about everyone else but man am I sick of snow, they are now forcasting 8 inches for us....what is that about? Well this time of year in Brookings it is the annual Brookings City Wide clean up. What this means is anything you have that is junk and you no longer want all you have to do it haul it out to the curb and the city comes by and picks it up for you. Residents could start filling up there curbs on Sunday and our part of the town gets picked up first starting next Monday. I am telling you people put everything out there from toilets, trees, fridges to stoves. It is very amazing to see the stuff that is laying out but what is more funny is the people we go curb shopping and pick up other people's stuff. Last night we cleaned out our garage, basement and even did some landscaping (cutting down a little ugly pinetree and trimmed some branches) and hauled it all out to the curb. No more then 15 minutes later a guy stopped and did some shopping and found a few things and was on this way. Jon just called me and reported that our pile went from heaping high to hardly anything left other then the branches and the little ugly pine tree. I do have to admit my brother and I do on occation go curb shopping but what we find always works and is always a good deal. Two years ago we saw what we thought was a fridge and we were going to use it in his garage but once we got it home and pluged in we found out it was a freezer but of course you always have room for a freezer and still to this day it has worked like a charm......rememeber this was sitting on someone's curb. So I should not say everything is junk because 98% of it is but there is always that other 2%. You know what they say one man's junk is another man's treasure!! Hello to everyone and I hope this last weekend was a good one?!? Ours was alright nothing too exciting to report. I can sum up what I did into one word "work" yep all weekend. It is banquet season and Saturday was a big night for us. We did the FCS banquet for 517 people, Volleyball banquet for 85, Fire and Ice for around 200 and a few little things so it was very crazy. Then yesterday I worked at the Jackrabbit Reception talking to parents and seniors in high school about meal plans. Jon and Trevor on the other hand did not have such a busy schedule. Jon worked Friday and Saturday in Hendricks tinning the Tractor Parts roof along with my brother so my mom entertained Trevor for the day. Then Sunday they were bums and relaxed all day, what a great day to do that with it being such a crappy day. I do not know about anyone else but I am sooo ready for some nice weather!! 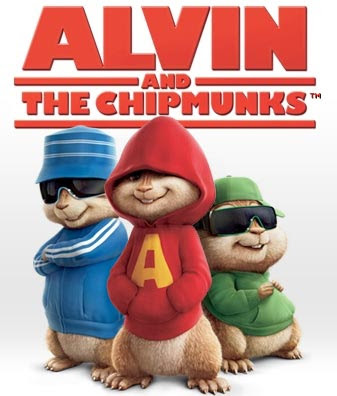 Yesterday I rented this movie for Trevor to watch and he loved it! It is a very cute movie so if you have time you should rent it. He thought it was just amazing that chipmunks could sing and dance. Since Trevor was little he has watched Jon shave and has always been so amazed and last night was no different so Jon put shaving cream on Trevor's face he was in heaven, he just loved it! He came running out of the bathroom saying "mommy mommy look at me" so I just had to take a picture of the 2 of them and man look at that boy smile!!! Then it dawned on me that I had taken a picture like this 2 other times so I thought I would share those too. Isn't it funny how one day Trevor is interested in one thing and then the next day it is something totally different. Well lately it has been building tents and forts with blankets, chairs, cusions and whatever else he can find. So this past weekend he decided to build a fort on the couch with all the cousins and a blanket. It must that certain age when you start to do things like this because I remember when I was little we would build forts using the kitchen table. We would put blankets on it so it was enclosed and man was it a good time. Maybe he just takes after his mom? ?